Wiring in a sailboat's mast is often used for the masthead light or for an antenna. Sailboat mast wiring is best run inside a hollow aluminum mast. Many masts have a pre-installed conduit inside. If not, use a PVC pipe or other protection to prevent the wires from slapping against the mast walls or chafing against the halyards that may also run inside the mast. You must also pay special attention to preventing leaks at the points where the wires pass through the mast and the deck. Use marine grade wiring and power wiring sized to carry the expected currents at 12V. Drill one adequately sized hole into the side of the mast about 2 inches from the bottom end and another at the top through the flat part at the end, near the edge. Depending on the size of the wires and the conduit to be used, these holes could be between 1/2 inch and 1 inch. If there is an internal conduit, install the wiring as detailed in Step 3. If there is no conduit, go to Step 2. Insert a PVC conduit into the mast through the hole at the top. Drill holes through the mast and conduit about every 4 feet the length of the mast, and use compression rivets to rivet the conduit in place. Inserted bent wires through some of the holes to keep the conduit in position while riveting through the other holes. Alternatively, glue the conduit into place. Another type of protection is the plumber's foam used for insulating pipes. Place foam around the wires in sections as the wires are inserted into the mast in Step 3 but the foam may be subject to damage if internal halyards are present. Halyards are the ropes or wires used to raise and lower the sails and they can run inside or outside the mast. If they are run inside the mast, do not use foam. An enclosure is required to prevent the wires from slapping against the inside of the mast although some sailors swear by the use of tie wraps placed around the wires every 3 or 4 feet and with the tails left on. The tails then keep the wires from moving freely in the mast. Assemble the wires and cables into a bundle. Insert the electrician's fish wire into the conduit and use it to draw the wiring through the conduit. Press the rubber grommets into place where the wires pass through the mast. The rubber grommets must be the correct size for the holes so they can prevent water from entering the mast. They go around the wires and fit snugly into the holes when pressed in from the outside. Connect the wiring to the light, antenna or other equipment at the top of the mast. Connect wires for the power connections for lights and other equipment to the plus and to the minus terminal of each item. Connect coaxial cable for the antenna to the coaxial connector on the antenna. If your mast is deck stepped -- stands on the deck instead of going through it -- form the wiring at the bottom of the mast into a an S shape, called a drip loop, to allow the water drip off before the wiring goes through the deck via the cable clamp. Install the cable clamp in a hole drilled through the deck to prevent water from leaking around the cables. The cables go through the clamp and the clamp is then tightened to make a snug fit. Below deck, connect the wiring to a terminal strip. 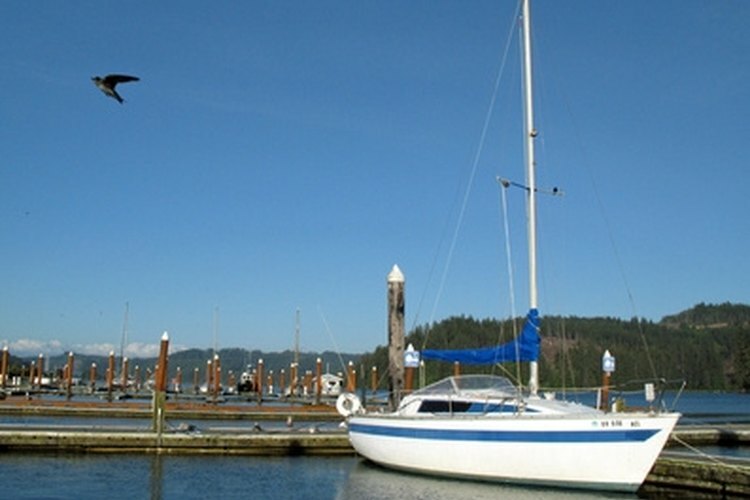 The terminals lead to the power or signal wiring of the boat and permit you to disconnect the wiring when the mast is removed. Run extra wiring for future equipment and/or leave a nylon line in the conduit so additional wires can be pulled through in the future.